This morning (29th April) witnessed Ulaganayagan unveiling the title of his next trilingual at the Nadigar Sangam Complex in Chennai. While talking about the film, he said that 85% of the shoot will happen in America and the rest in Chennai. He also added that he plans to begin the shoot of the film by the 14th of May and wrap around July. 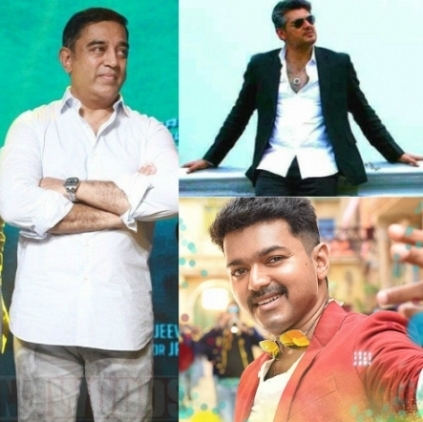 When the topic of Vijay and Ajith not participating in the recently held Natchathira cricket match came up, Kamal said, “There is no need for Vijay and Ajith to give any explanation as to why they did not attend the cricket match. They are all our brothers. Sangam always extends warm hands to them”. People looking for online information on Kamal Haasan, Ajith, Nadigar sangam, Vijay will find this news story useful.